Pimento peppers have a sweet flavor and a very mild heat. 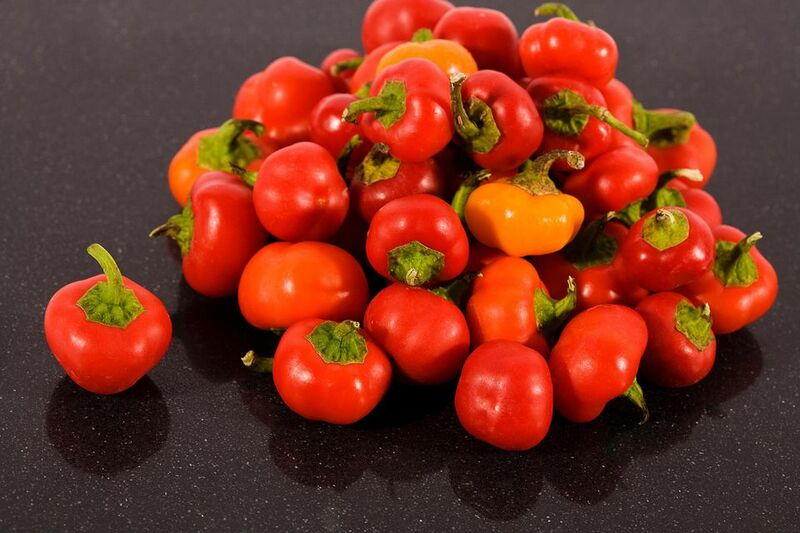 This nightshade—also known as a cherry pepper because of its red color and round shape—is commonly diced and stuffed into Spanish or Manzanilla olives in Mediterranean cuisine. Stateside, pimento-stuffed olives make a traditional garnish for martinis and are found in the pimento loaves our grandmas used to slice and serve for sandwiches. Pimentos are also a key ingredient for a favorite dinner party appetizer, pimento cheese. Because pimentos are sweet and mild, they can be stuffed with rice or cheese and served as an appetizer on their own, too. And in the grocery store, you can find pimentos—often called "cherry peppers"—alongside the olives and pickles. Pimentos register between 100 and 500 heat units on the Scoville Scale, making them one of the mildest of all the chili peppers. In fact, Pimentos have almost no heat to them and are considered sweet and more aromatic than their red pepper cousin. In comparison to the heat of a jalapeño pepper, pimentos are about 40 times milder. Still, if you're looking to add the tiniest bit of kick to your dish, a pimento will do the trick. Home-grown pimentos add variety to any container garden. But due to their long growing cycle, you need to either live in a climate conducive to growing them outdoors or grow them inside a greenhouse. Source your seeds from a reputable seed purveyor, and then plant the seeds in moist soil and place them in a sunny window for six to eight weeks, until they sprout (keeping the soil consistently moist). Once sprouting occurs and the weather becomes summer-like, it's time to move your peppers outdoors. Place them in a south- or west-facing location with a steady supply of water and watch them grow. Pick your pimentos when they take on their classic shiny red color. And since pimentos are susceptible to frost and cooler temperatures, place your plants indoors if night temperatures could fall below 60. Pimentos aren't just a fancy martini garnish; they're also full of nutritional value. In fact, this nightshade is loaded with Vitamins A and C, both powerful antioxidants that promote a healthy immune system and help strengthen your skin, teeth, and blood vessels. Pimentos also contain approximately 3 percent of the daily recommended amount of folate (Vitamin B9). Because of this high concentration, they're considered especially good for pregnant women. The Vitamin K found in these little red peppers helps prevent osteoporosis and aids in the absorption of Vitamin D (from the sun or otherwise). However, if you suffer from chronic heartburn or IBS, consuming pimentos, or any other spicy nightshade is not advised. Paprika is a popular spice made by grounding various peppers to a fine powder. And while different parts of the world source different peppers for paprika, some regions of Spain and the United States use pimentos in the spice mixture. Many chefs prefer the mild, sweet flavor of paprika made with pimentos over the heat of other spices, like cayenne, that contain capsaicin (a mild irritant). Make your own paprika by taking your home-grown peppers, drying them in the sun or on low heat in the oven, and grinding them in a blade grinder.